(Decatur) Stephen Decatur H.S. "Runnin' Reds"
Decatur (population 81,860) sits in the middle of the state of Illinois, linked by U.S. Route 51, Interstate 72, and Illinois Routes 105 and 121. The city is known for its production of soybeans, as evidenced by the location of the world-wide offices of Archer Daniels Midland (ADM) and the A.E. Staley Company. Lake Decatur sits on the east and side side of the city, where the Chicago Bears football franchise was born in 1920. The city is named for War of 1812 naval hero Stephen Decatur (1779-1820) who captured the British Macedonian in a desperate fight near Madiera Island. Outside of John Paul Jones and David Farragut, Decatur was best known for saying: "Our country...may she always be in the right; but our country, right or wrong!" He is also credited for quelling attacks made by pirates in the Mediterranean Sea, who had discouraged commerce by many nations to the region and took sailors as slaves to countries such as Morocco, Algeria, Tunis, and Tripoli, also known as the Barbery States. Decatur was also credited with one of the most daring acts in naval history on February 16th, 1804, after the US frigate Philadelphia was captured by the Barbery States, then-Lieutenant Decatur with a small ship and crew came into the harbor unnoticed where the Philadelphia was anchored, and set the frigate on fire while not losing a life. For his actions, Decatur was promoted to Captain, and eventually to Commodore before losing his life in a duel in 1820 to a fellow Commodore he had court-martialed and Decatur refused to reinstate him to his rank. As a school, 1862 was the year that 64 students enrolled in secondary education what was to be called Decatur High School, scattered among several buildings for their six-month term (or school year). As the population grew towards the turn of the 20th Century, funds were raised to build a new school, which officially opened at the corner of East North Street and South Franklin Street near the downtown district in 1911. 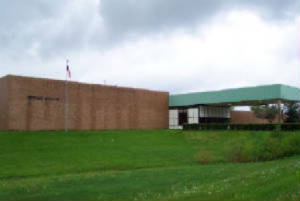 As the town grew, so did the enrollment as Lakeview High School (also on this site) was annexed into the city, and two newer schools, Eisenhower and MacArthur, were built to ease the overcrowding at Decatur High School, which changed its name to Stephen Decatur High School after the 1956-57 school year. Even with three other public high schools in Decatur, the enrollment continued to increase and a newer, state-of-the-art facility was opened in 1975 with amenities such as air conditioning, glass walls, a rubberized gymnasium floor, carpeting, and much more was in the new building. But as the population and enrollments went down in the mid-1980's and thru the 1990's, the decision was made to close down Stephen Decatur and split the students between the two schools created to ease the enrollment years before, MacArthur and Eisenhower, in 2000. Today, the building is home to Stephen Decatur Middle School. Stephen Decatur is said to have one of the oldest pubications for a high school newpaper (The Observer} and yearbook (The Decanois) in central Illinois. School Nickname: the "Runnin' Reds"
Go Decatur win this game! Stephen Decatur High School offered a number of athletic opportunities for its students while the doors were open. On the boys' side, football, basketball, baseball, golf, tennis, track, cross-country, and wrestling, while the girls had volleyball, basketball, track, and tennis. According to the IHSA website (www.ihsa.org), there was no mention of softball or cross-country at the school. If anyone knows if these sports or others existed at the school, please let us know so we can include them. The Runnin' Reds were part of the Big 12 Conference, competing with the likes of Champaign Central, Champaign Centennial, Urbana, Rantoul, Danville, Mattoon, fellow Decatur schools Eisenhower and MacArthur, in addition to Bloomington, Normal, Normal West, Lincoln, among others. If you've been to the restroom lately, then settle in for some good reading about this historic hoops program in the state of Illinois. John Schneiter would lead a team to a title in 1962, two years after Gay Kintner died from a heart attack at a game in 1960 against cross-town rival MacArthur. Decatur and Stephen Decatur wound placing in the final four on 10 occasions out of 23 times it qualified, ensuring that they would take home a trophy from the state finals. The "two" schools combined record is also one of a handful in state history that won over 1,000 varsity contests, winning 1,352 games while losing 912 for a percentage of .597 in games played between 1913 and 2000. Stephen Decatur High School's basektball records are listed below. SDHS made the Sweet 16 of IHSA basketball tourney eight times, the Elite 8 six times, and the Final Four four times, coming away with one State Championship!! Harvey Thornton won State Title. Photo Taken in 2000 After Last Home Game (A Victory) - Courtesy of David Lee, Jr. EXCELLENT JOB RUNNIN' REDS BOYS' BASKETBALL!!!!!!! 1963 Champion According to the 52nd (1994) Centralia Holiday Tounament program:"Decatur, behind the first three quarters, upset Belleville 52-46." 1967 Champion "Decatur battled Edwardsville and took the championship by a score of 68-63." Once the basketballs were put away, the Red and White excelled on the cinder tracks, winding up in the top 10 list of teams at the state meets on one occasion, along with winning two district titles. The Decatur thinclads wound up with a FIFTH place finish in 1971. Individuals representing the school would win the medals on seven occasions. GREAT JOB RUNNIN' RED TRACKSTERS!!!!!!! Maybe not as successful as the boys' basketball and track teams, Stephen Decatur did field a team on the gridiron from 1957 until 1999, winning many contests before the doors closed. The Runnin' Reds had some solid seasons and were very competitive, sporting winning records at the end of eleven different seasons. In a 1993 game against Bloomington, Decatur's Rhassan Smith receivied a kickoff at his one-yard line and ran all the way to score a touchdown, making for a 99-yard rreturn. "In 1976 the Reds broke St. Teresa's 37-game winning streak which included back-to-back state titles. That was a most memorable game in which several thousand fans packed Piggott Field to watch. It bears a mention in the scheme of memorable moments at SDHS." GOOD JOB RED & WHITE GRIDDERS!!!! Stephen Decatur High School made a splash on the wrestling mats, taking home a third and two fourth place finishes as a team in the state meet, along with winning five district titles and having four state champions. "You'll find Coach Simons in 2004 Illinois Wrestling Hall of Fame. He ended his career at Glenbard. He was a great guy who taught me a lot. I wrestled HW in 1968 weighing 177 lbs. I never won, but never was pinned, and was typicallly outweighed by over 50 pounds (my first match was me at 177 lbs. versus Charles Sharp at 264 lbs. !...I lost 9-6)"
Ben Cooper STATE CHAMPION 154 lbs. Aaron Holloway STATE CHAMPION 165 lbs. Jim Hunt 6th Place 112 lbs. Mark Malley STATE CHAMPION 145 lbs. Rusty Cunningham 2nd Place 112 lbs. Rusty Cunningham 3rd Place 112 lbs. Ty McMillan 3rd Place 175 lbs. 1972-73 Kevin Simcox 6th Place 98 lbs. 1983-84AA Scott Mitchell 4th Place 132 lbs. Stephen Decatur High School short netters were worthy representatives for Central Illinois to the state tennis meets, even bringing home a third place finish once, along with two other top-ten finishes. Who says that a school from downstate couldn't compete with the Chicagoland schools that have usually dominated this event? The Runnin' Reds proved this "theory" wrong! The Runnin' Red linksters made a name for themselves on the golf course, winning IHSA hardware along the way. It was a team game for Stephen Decatur, as only two individuals were considered finalists for the medalist position at the state finals. On three occasions Stephen Decatur won Regional Titles. The Runnin' Reds made their way to the Elite 8 of the IHSA Baseball Playoffs once. Success carried over hill and dale for the Stephen Decatur boys' cross-country team, qualifying for the state meet three times over a four-year period during the late 1960's. The coach for these teams is unknown. Even the tankmen of Stephen Decatur were successful to an extent, bringing home two individual golds at the state meet. Just like their male counterparts, Stephen Decatur's girls' hoops program made a name for itself. During the 1980's, one team qualified for the Class AA Sweet Sixteen. Stephen Decatur had a successful bowling program for the girls that chose to go to the bowling houses, sending two girls to the state finals. Both ladies received medals for placing as one of the top 10 individuals. The Stephen Decatur netters held their own in Central Illinois, winning three sectionals to qualify for the state meet. Unfortunately, the name of the coach for these teams is unknown. Inside the school, Stephen Decatur's volleyball squad came away with two trophies from the IHSA in the state tournament, taking a district in the old one-class system, then a AA regional. Win-loss records are unknown. From Coach Nanci Day-LeMaster: "Hello, I was the coach for Stephen Decatur High School Volleyball team in 1997. (My) assistant coach was Debi Kwasny and team members were: Lindsay LeMaster, Nikki Kasserman, Christain Keifer, Stephanie Gruenewald, Sheree Gruenewald, Megan Denison, and Alicia Joyner." The Stephen Decatur girls tracksters were just as fortunate as the boys' team was to have placed high enough to bring home medals from the state track meet, with most of them in relay events. One athlete in particular put Stephen Decatur's girls' swimming program on the map over a three-year period in the 1990s prior to the school's closure. Erin Didde brought home four medals from the state finals, confirming that there was a girls' swim team at the school. ---Gay Kintner - won 649 games as basketball coach from 1928-60, including three state titles, for a winning percentage of .708. Also coached football and baseball, with one state Elite Eight qualifier in baseball. ---John Schneiter - won one state title in four-plus years (1960-63) as head basketball coach with a record of 79-24 for a mark of .767. Schneiter later captured a second and third place at the state basketball finals while coaching at Winnetka New Trier East, and had eight teams win the team championship at the IHSA Boys' Tennis Finals, along with a second place and two third places. ---Jack Kenny - was 109-22 (.832) coaching boys' basketball from 1963-67, winning a third and a fourth place at the state finals. Later became principal of the school. ---Jim Tate - 69-66-8 in 16 years of coaching football, with eight of those squads finishing with winning records, including 8-1 in 1962. ---Mark Malley - state champion wrestler, winning the 145-pound class in 1968 & 1969. ---Kostaki Chiligiris - won the 100 and 200 freestyle events at the state meet in 1994.
from Jack Sunderlik (class of 1964): The 1963-64 SDHS "Runnin' Reds" won the Decatur City Tournament and the 1963 Centralia Christmas Holiday Basketball Tournament. I played on the '62 State Champs, the '63 Elite Eight Team, and the 1964 3rd Place team. 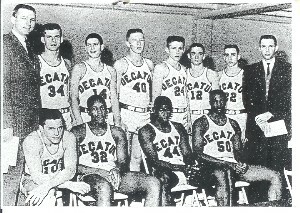 "This year (November 2012) at the Decatur Thanksgiving Tournament, the school district will be honoring the 1963-64 Stephen Decatur Runnin' Reds Basketball Team that finished 3rd in the IHSA State Tournament. Eleven of the players have already confirmed that they will be there for the presentation. We should have won the Championship that year. 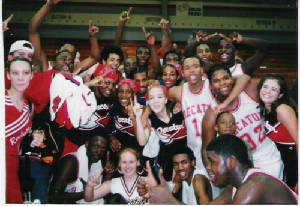 I believe that we were the best team in the glorified history of Stephen Decatur H.S. and the city of Decatur. To this day, the game against the (Cobden) Apple Knockers still haunts me and leaves a bad taste in my mouth." to tell the story about the history of Stephen Decatur High School, and we need your help. If you have any additional information or pictures, we would be most happy to use them. Please email your information to us at dr.veeman@gmail.com or send it to the address listed below. The words to the school fight song are being sought. Special thanks go to longtime Decatur sportswriter Tom McNamara for his help, along former Chicago sportswriter Jim Enright's book March Madness: The History of High School Basketball in Illinois (1977) for photos and valuable information in preparing this page.